Fighters will hit the scales at 9 a.m. PST, noon EST today ahead of tomorrow’s UFC on FOX 22 from Sacramento, California. Full UFC on FOX 22 weigh-in results are below. The early weigh-ins, which precede the day’s ceremonial affair, take place at the UFC host hotel in Sacramento. The UFC on FOX 22 ceremonial weigh-ins take place at 7 p.m. 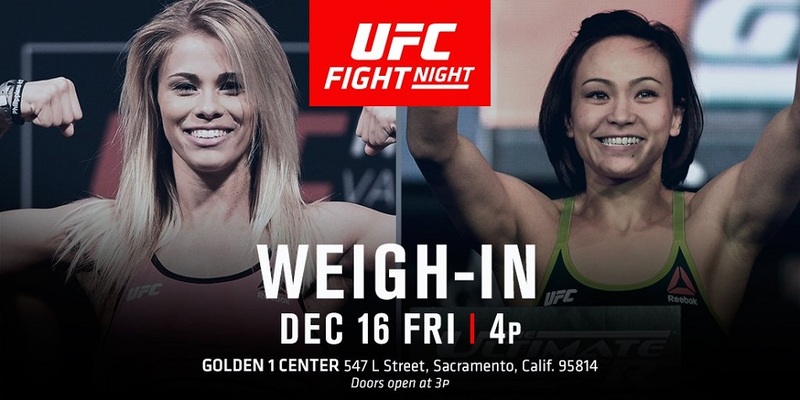 ET at Golden 1 Center in Sacramento, the same venue that hosts Saturday’s event, which airs on FOX following prelims on FS1 and UFC Fight Pass. In the main event, the number seven ranked UFC women’s strawweight competitor Paige VanZant takes on number 11 ranked, Michelle Waterson. In the evening’s co-main event, two alum of the show, ‘Dana White: Lookin’ For a Fight,’ will settle their differences as Mickey Gall and Sage Northcutt go toe-to-toe. Also, ‘The California Kid,’ Urijah Faber will fight in his final mixed martial arts contest as he takes on Brad Pickett before hanging up the gloves. You can watch the ceremonial weigh-ins below at 7 pm EST.